My Art at the 2015 Canadian Screen Awards! In January, I was very excited to be contacted and asked to provide some of my art cards to the presenters at the Canadian Screen Awards taking place in Toronto on March 1st. This prestigious awards ceremony which honours excellence in Canadian film, television and digital media will be hosted by actress and comedian Andrea Martin. Confirmed presenters include Kiefer Sutherland, Julianne Moore, Kim Cattrall, Megan Follows, Tatiana Maslany and Eugene Levy, along with many others. My cards will be going into gift bags along with lots of other wonderful products. 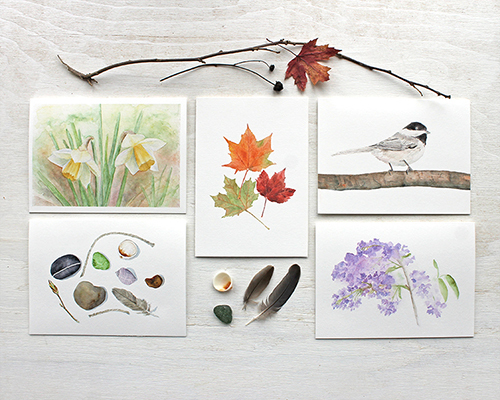 Above is the collection of note cards that I assembled--five cards featuring some of my favourite watercolour paintings. 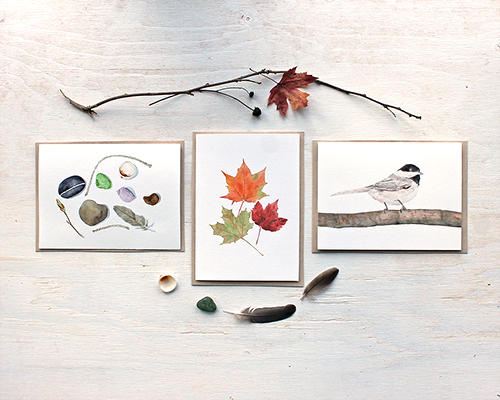 I think these images provide a good sense of me as a Canadian artist. 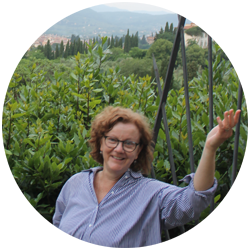 The paintings I chose were inspired by my garden, forested areas in our region and a beach visited on a vacation. I chose my popular 'Maple Leaves' image as the centre of my collection, since the maple leaf is an iconic symbol of Canada. 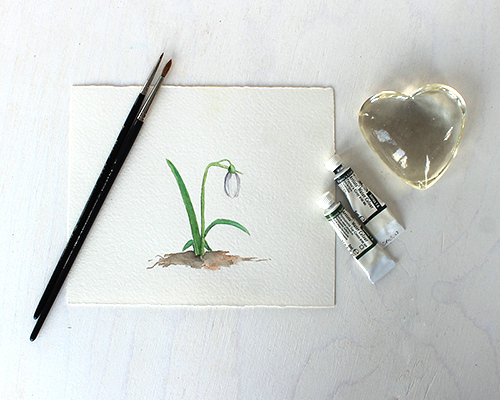 I considered including my 'Winter Forest' painting but then thought 'No...we've all had enough winter at this point!'. Instead I included two of my spring garden images. 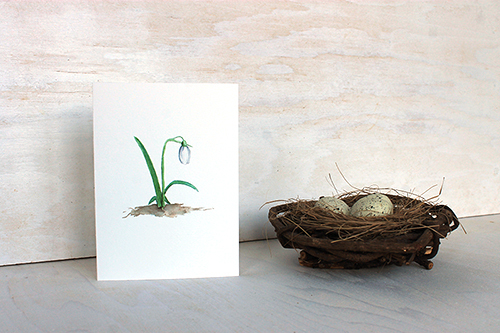 Because I print my cards in my studio, feed them into my printer one by one and finish them by hand, it took me about four days to print, trim, score and package everything. These cards were produced with love and care! What an amazing thrill to share my watercolour art with such a talented group of people! I really hope that they enjoy my artwork. For those of you in Canada, the Canadian Screen Awards will air on Sunday March 1st at 8:00 p.m. on CBC (8:30 in NT). 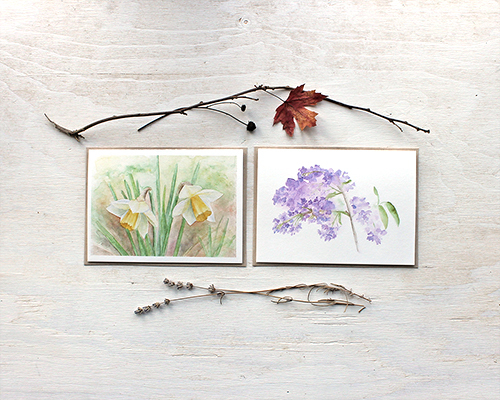 This special note card collection is now available for purchase in my art shop: http://www.trowelandpaintbrush.com/product/nature-collection-set-of-watercolour-cards. I am constantly adding new work to my art shop and will continue to add things in upcoming weeks. I hope you'll take a peek every now and then. 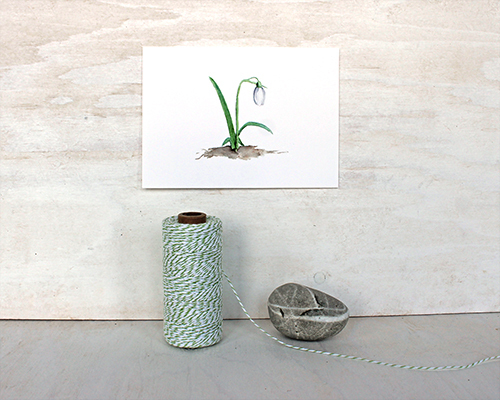 At this time of year, especially after the intensely cold January and early February we have had, we become anxious for signs of spring. 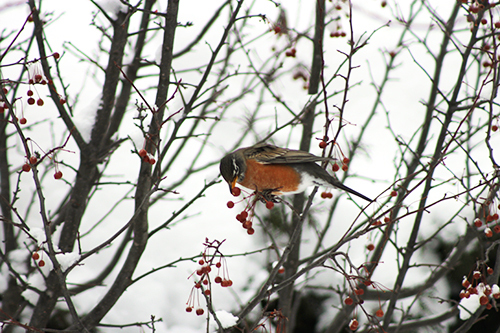 This morning a big, fluffy robin spent some time in our garden. 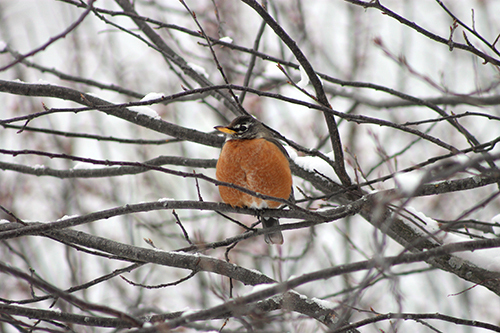 While I would love to take this as confirmation that warmer weather is on its way, I've noticed robins in our neighbourhood throughout this winter, even during the freezing temperatures of past weeks. I looked up the behaviour as it seemed unusual. 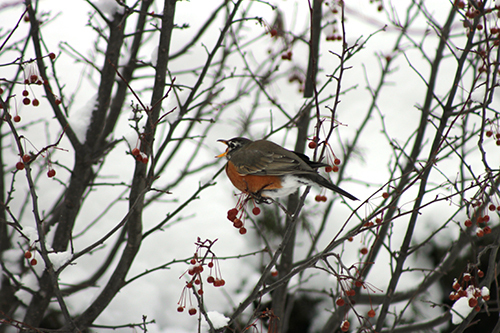 Some sources suggested that if food sources are available, robins may overwinter in order to claim the best spring breeding territory. When I think about it, when I've seen them in past weeks, they have usually been perched on fruit trees (indigenous serviceberry) at the edge of a nearby forest. Today, this big fellow sat long enough in a tree in our back garden that I had time to run upstairs to get my long-range lens. 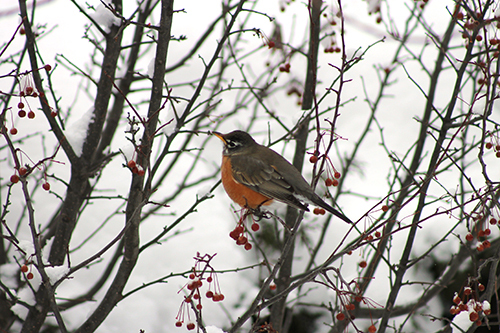 I just love how he looks with the snow-covered branches behind him. 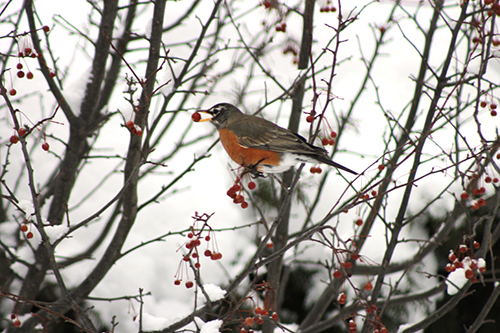 Then he moved to the trees lining the back of our garden that are still covered with frozen crabapples. He carefully selected one. When he tried to swallow it, there was an awkward moment and I was worried that he had chosen an apple that was too big. He readjusted it in his beak and then everything seemed to be fine. So, I think I will just have to consider this as a sweet Saturday visit rather than a sure sign of spring.